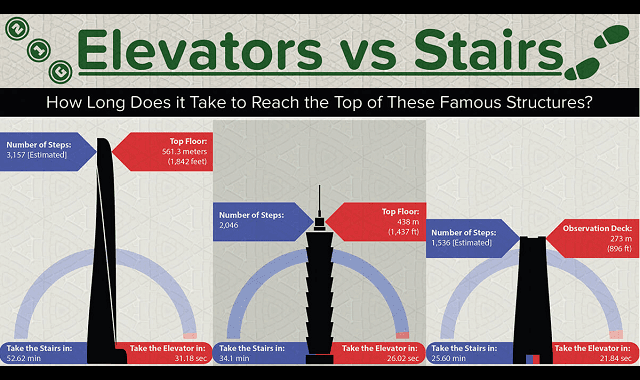 Elevators vs Stairs: How Long Does it Take to Reach the Top of These Famous Structures #Infographic ~ Visualistan '+g+"
For many centuries, we, humans, have been trying to get higher. That's how we eventually learned to fly. Most of us probably know the story about the Tower of Babel, when people tried to build a tower higher than the sky. Well, now it's happening. Sometimes it seems like countries compete on who is going to build the text tallest building on the planet. Anyway, the Tower of Babel probably didn't have an elevator. All modern building have them both: stairs and elevators. People today are too busy not to use elevators. Especially in buildings that are taller than 10 floors. Although for tourists, it is a great option to be able to use stairs instead. Especially for constructions like The Eiffel Tower – it's not too high. And the view is amazing, and getting better with every step you make! This infograhic is very simple and clear: it shows the big picture on how big distances we actually move without even realizing that.